Squirrel Repellent Spray, made with natural plant extracts to repel, deter and stop problem squirrels being a nuisance in your garden or house. This organic product contains an irritant which is distasteful to squirrels but it will not affect other garden animals or pets. This product is pallatable to birds. 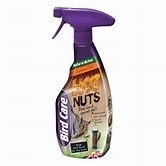 Outdoors: Use this spray on and around bird tables and bird feeders to stop and prevent squirrels taking and eating the bird food. Or use in flower and vegetable borders to prevent squirrels from digging up and eating your favourite plants. If squirrels are trying to get into your house, spray this Squirrel Repellent Spray under the eaves or on facia boards to deter these rodent pests and drive them away. Indoors: Use this spray around known or possible entry points to repel and stop squirrels gaining entry to your home.Squirrels can cause a lot of damage once they have made your loft or attic their home. They can be a fire hazard as they like to chew at electrical wiring! Each 750ml bottle of our Squirrel Repellent Spray will treat up to 225 square metres / 738 square feet. The treatment shoud be repeated every 48 hours until the squirrels have moved on. Please note that this product will be affected by rain conditions. Please note that we would always recommend this spray is used in conjunction with one of our indoor or outdoor electronic ultrasonic squirrel repellers.